Chocolate and strawberries, strawberries and cream. My mouth waters just thinking about putting those flavors together. I like taking proven combinations, and seeing if I can give them a twist to put my own spin on them. 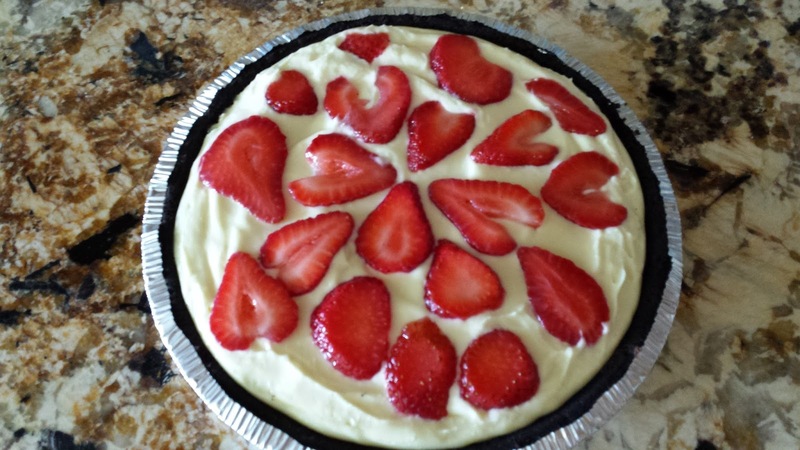 Case in point: I was looking at Pinterest and saw a recipe for strawberry pie. I wanted to make it for a cookout I was going to, and had chocolate ganache leftover from making S’mores Tarts. The idea came together, and this is the result. Put 1/4 cup chocolate ganache in the bottom of the pie shell, and spread out. Chill for 15 minutes. Spread a layer of strawberries over the ganache and cover with a layer of pastry cream. Repeat until the pie shell is full, ending with strawberries. Chill until firm, at least three hours.